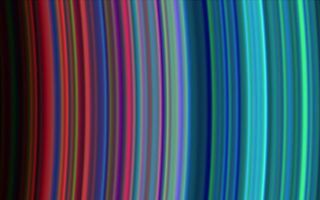 This colorful space wallpaper portrays a section of Saturn’s beautiful rings, four centuries after they were discovered by Galileo Galilei. Saturn’s rings were first observed in 1610. This colorful space wallpaper portrays a section of Saturn’s beautiful rings, four centuries after they were discovered by Galileo Galilei. Saturn’s rings were first observed in 1610. Despite using his newly created telescope, Galileo was confounded by what he saw: he referred to the peculiar shapes surrounding the planet as “Saturn’s children.” Only later did Christiaan Huygens propose that the mysterious shapes were actually rings orbiting the planet. These were named in the order in which they were discovered, using the first seven letters of the alphabet: the D-ring is closest to the planet, followed by C, B, A, F, G and E. The variation in the color of the rings arises from the differences in their composition. Turquoise-hued rings contain particles of nearly pure water ice, whereas reddish rings contain ice particles with more contaminants.